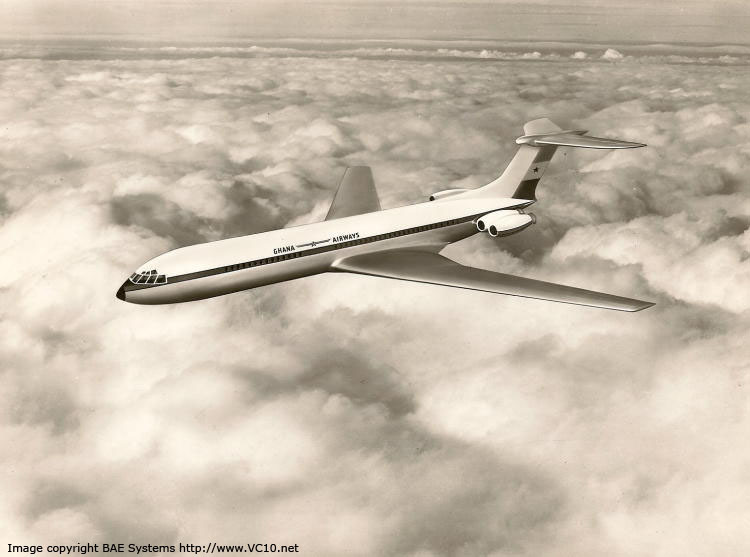 14 November 1964 First flight. 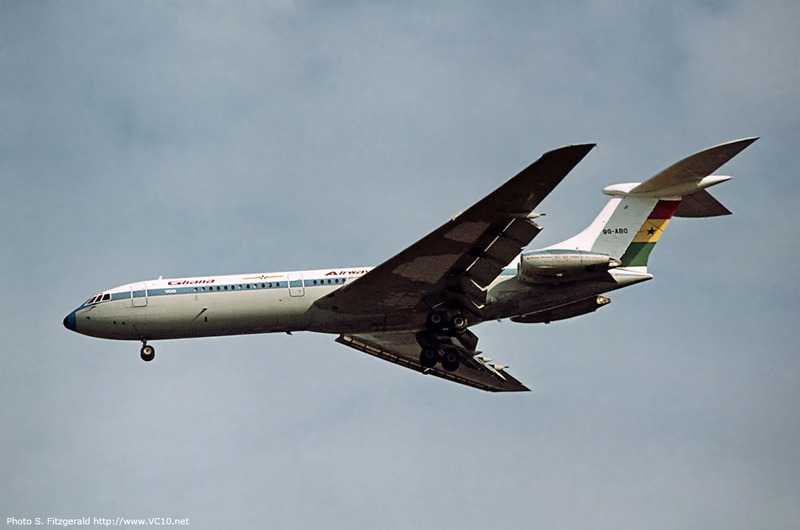 27 January 1965 Delivery to Ghana Airways as 9G-ABO. 18 December 1980 Taken out of service, ferried to Prestwick for storage. 1. 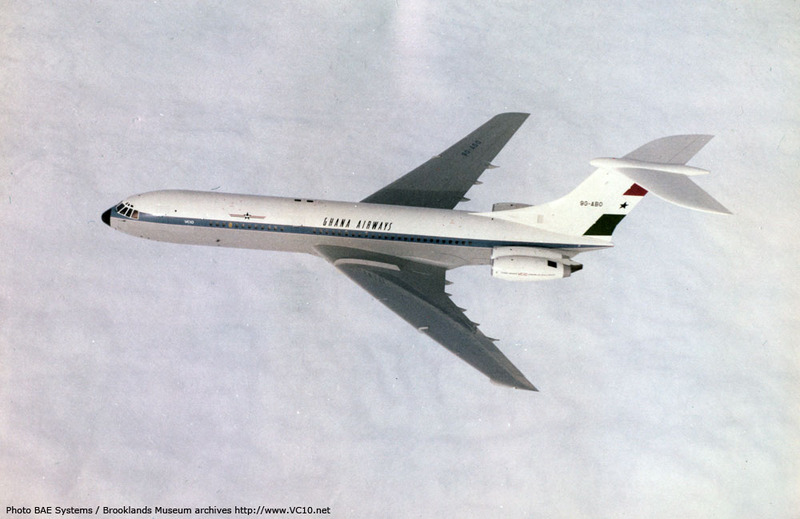 A promotional image showing what the Ghana Airways VC10 would look like. 2. 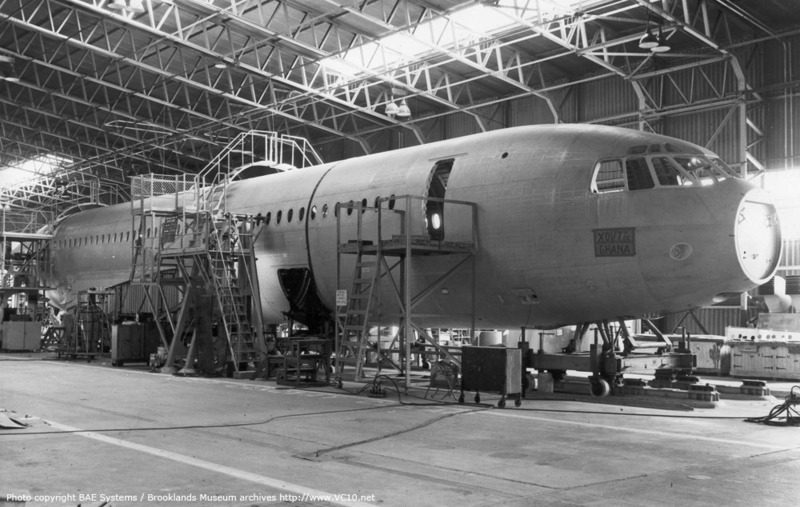 On 13 September 1963 this photo was taken which shows that the fuselage for 9G-ABO was coming together in the fuselage join-up jigs. 3. This photo of the flight deck was taken in the hangars at Wisley with the Ghana aircraft on jacks. 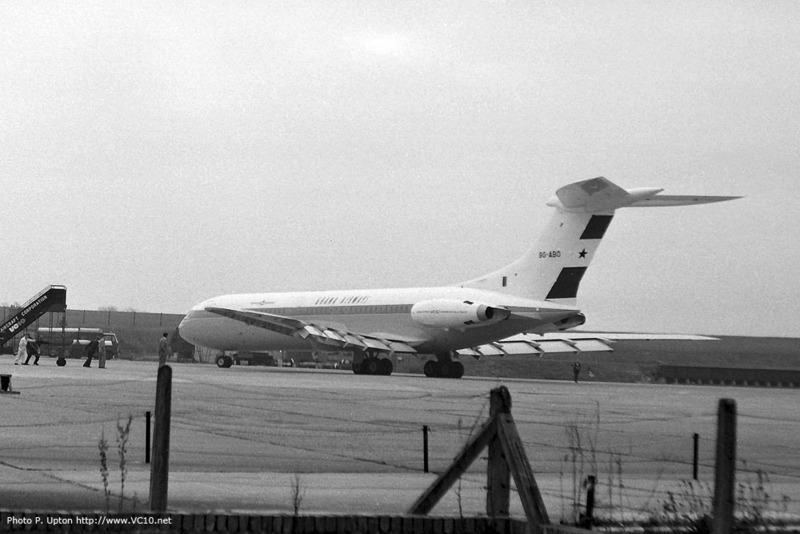 The Super VC10 prototype G-ASGA is seen through the windows. 4. 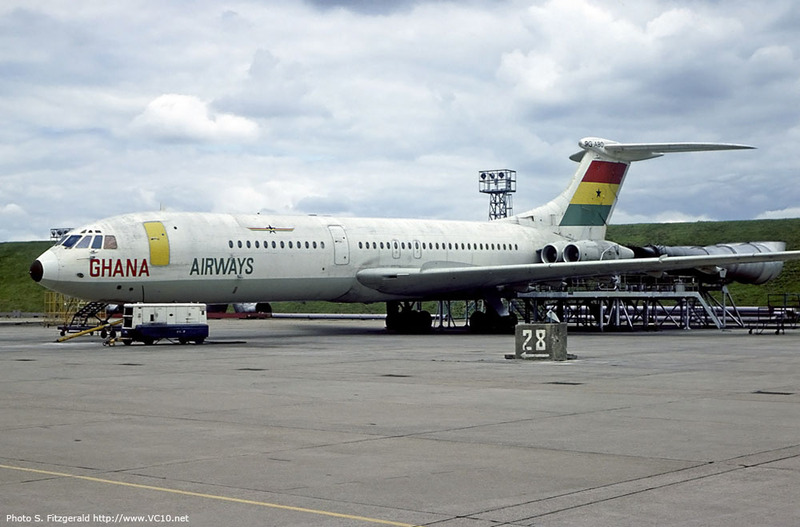 Peter Upton spotted the first Ghana Airways VC10 at Wisley during testing. 1. 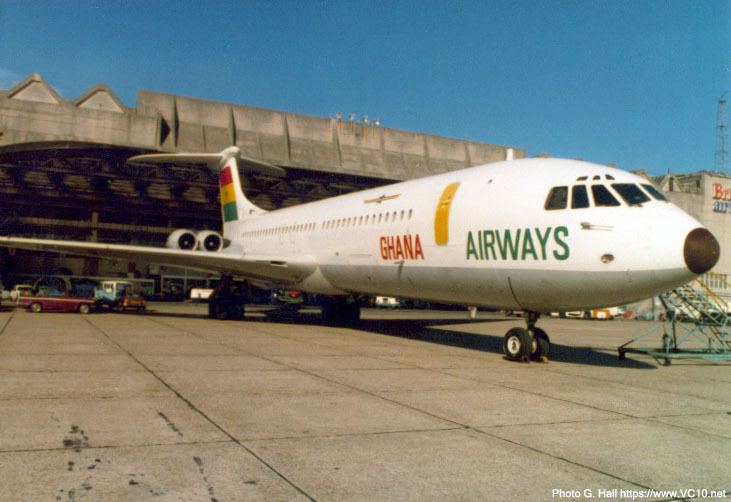 Shortly after the first Ghana Airways machine took to the air several air-to-air photos were taken which make an interesting comparison to the first image. 2. 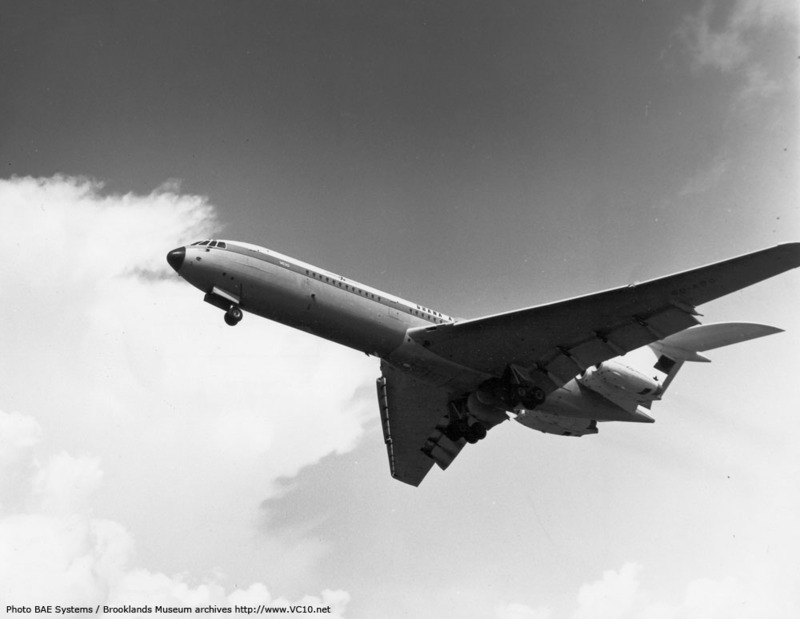 This shot of the aircraft banking away shows the underwing vortex fences which were tested on this aircraft and G-ASIW. 3. 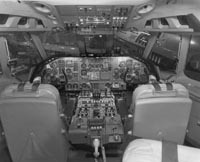 The gear is seen in transit with the doors still open on this shot of 9G-ABO. 4. 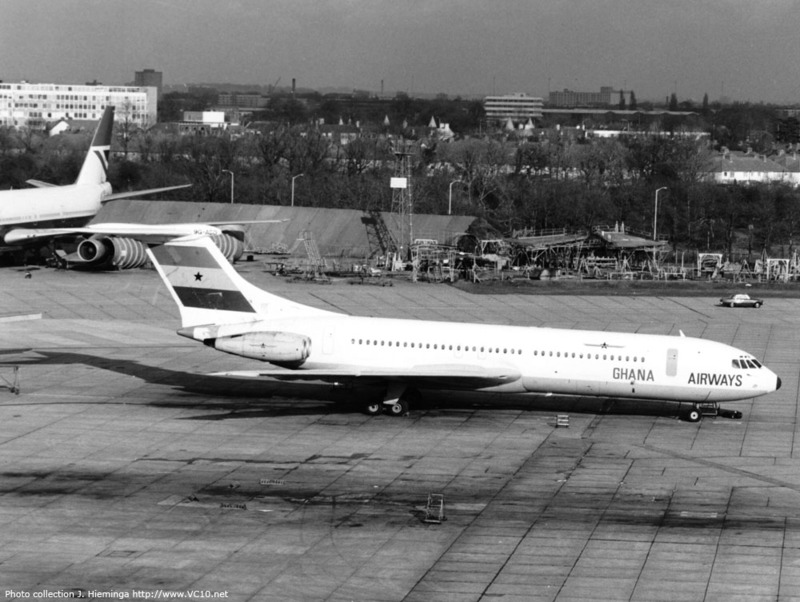 9G-ABO in service, seen next to a BOAC 707 at Heathrow. 1. 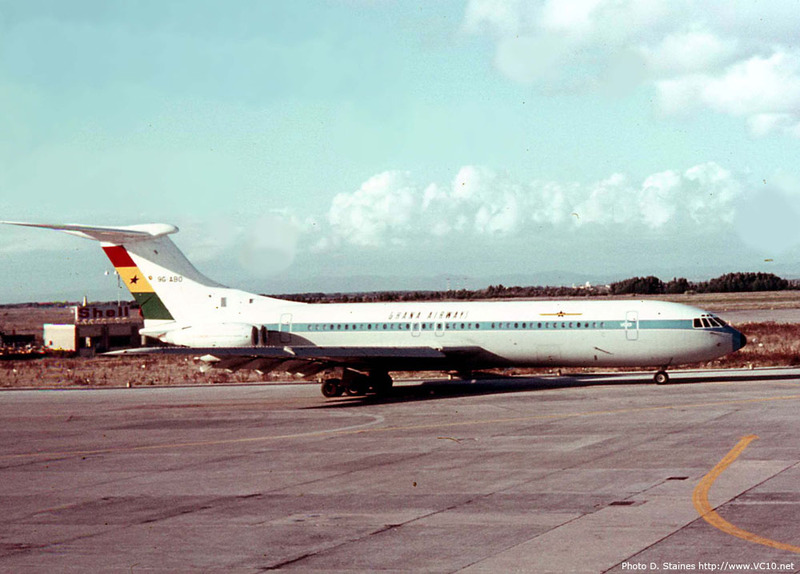 David Staines took this photo of 9G-ABO in its original colours at Fiumicino Airport (Rome, Italy) in 1967. 2. 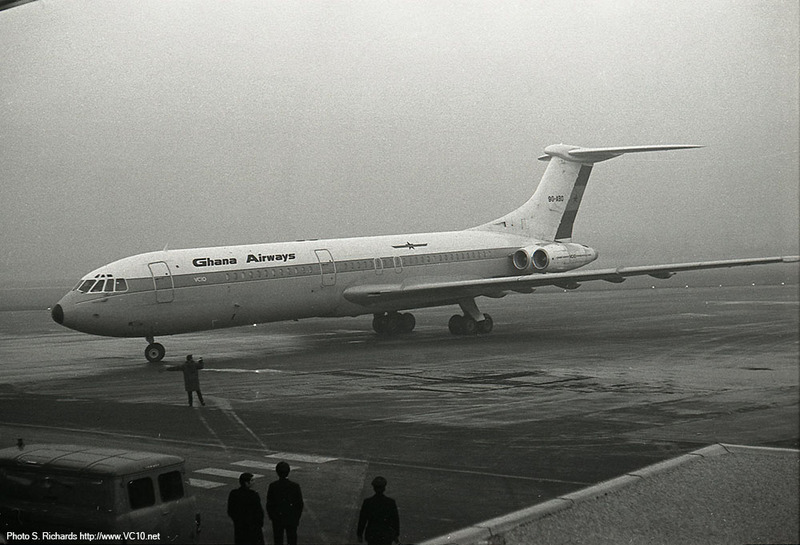 Another photo of the early Ghana Airways colour scheme on a cloudy day. 3-4. 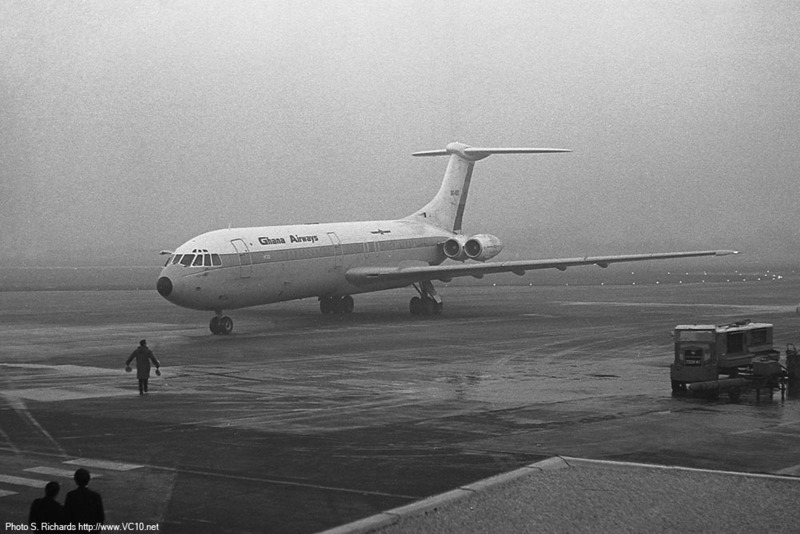 On 2nd January 1971 9G-ABO had to divert to Birmingham as Heathrow was completely fogged in. It is seen here being guided to a parking spot. See here for more photos from this unplanned event. 1. 9G-ABO approaching runway 28R at Heathrow on September 17th, 1972. The titling above the windows appears to have changed by now. 2. 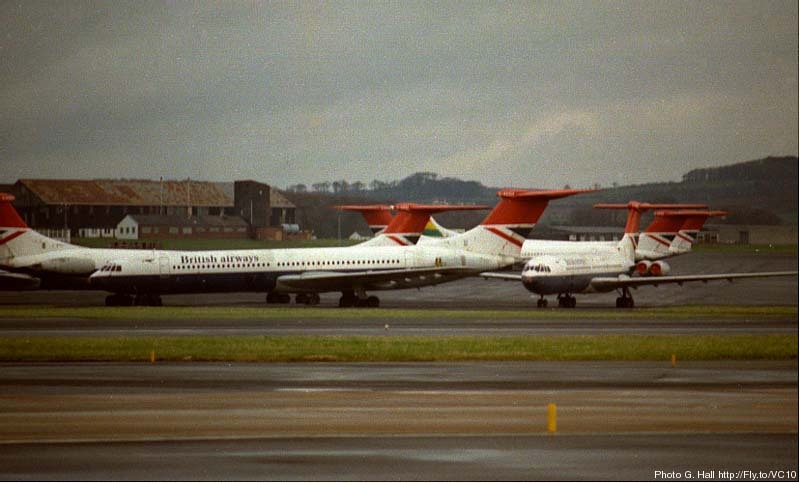 The second version of the colour scheme seen at the Heathrow maintenance base. 3. 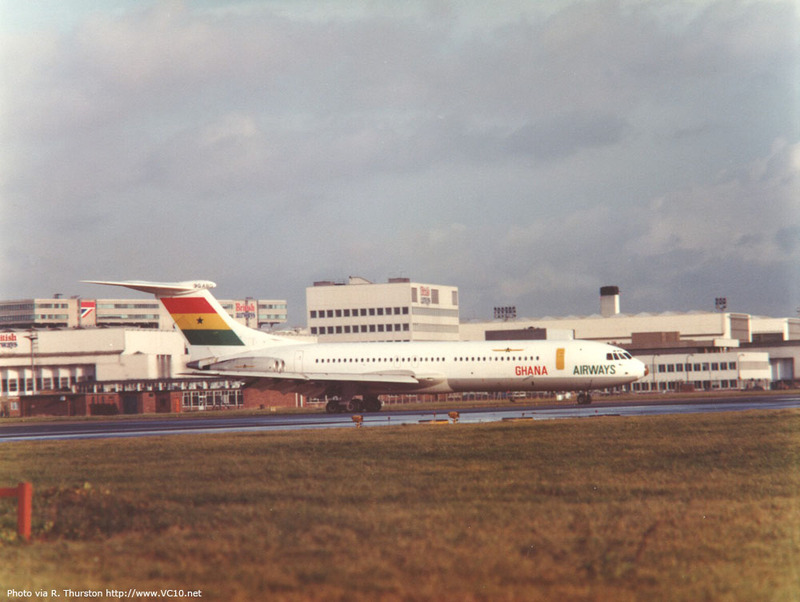 9G-ABO taxiing out at Heathrow showing the colourful scheme on Ghana Airways' sole VC10. 4. 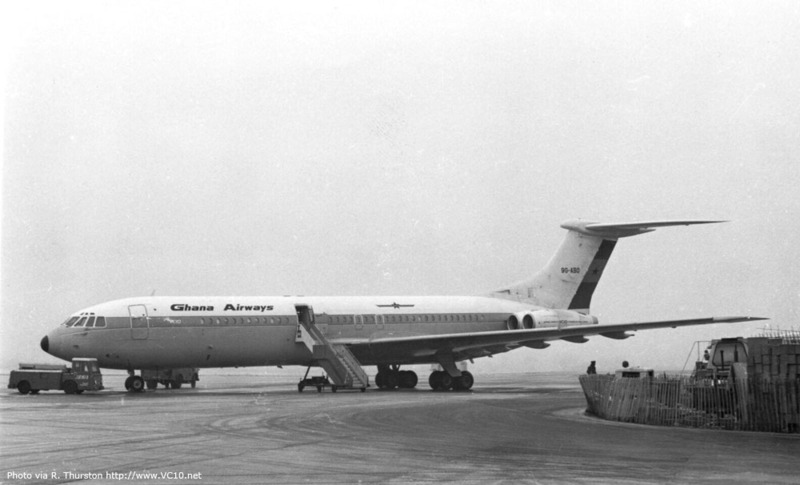 9G-ABO in the final Ghana Airways scheme worn by the VC10, a very 'modern' scheme compared to the early colours. The repainting was done in several steps during regular maintenance as the aircraft could not be taken out of service any longer than necessary. 1. 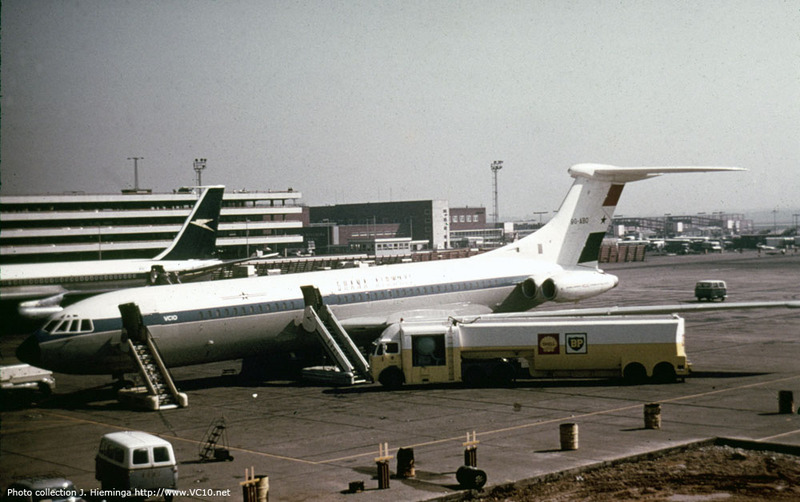 Ready for high power engine runs at Heathrow on 5th July 1980. 2. 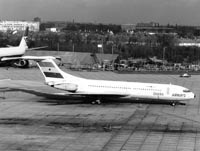 And this is where the aircraft ended up, stored at Prestwick with the BA Super VC10 fleet. The tail can just be seen in the center of the photo. 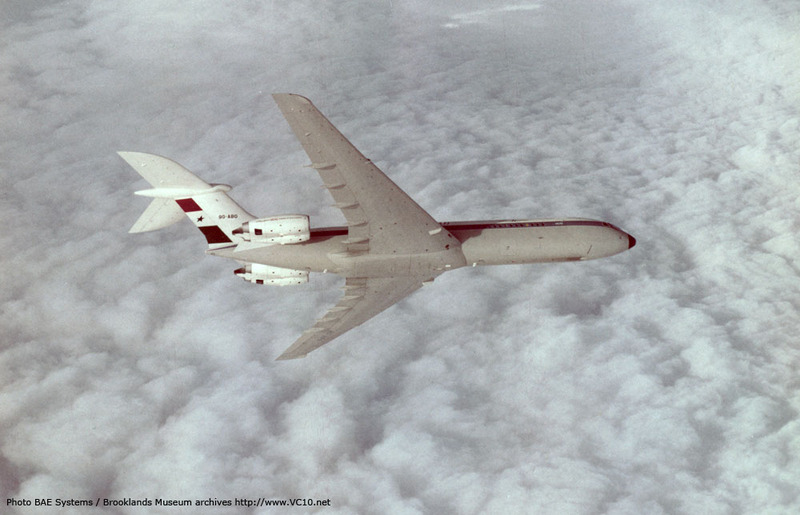 The VC10 was taken out of service in 1980, this photo is from 1981. 3. 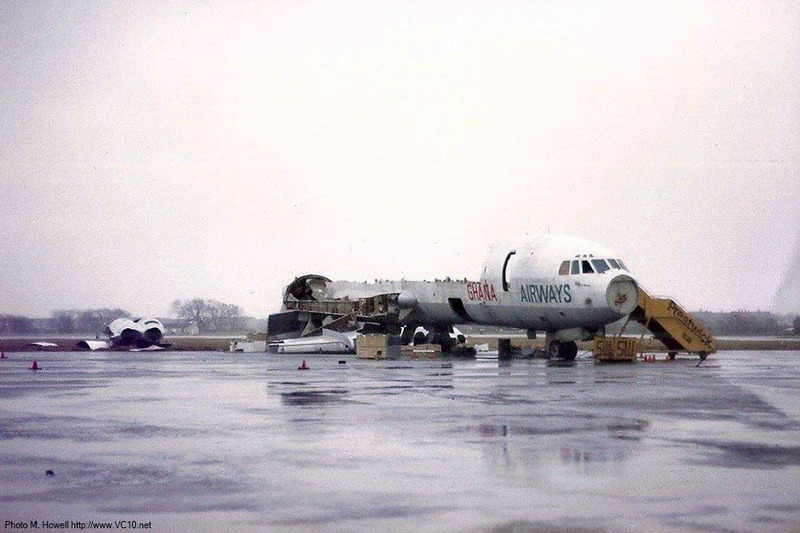 Mark Howell took this photo in 1983, showing the partially scrapped remains of 9G-ABO at Prestwick. GA Medium blue cheatline edged with red and white, white over grey fuselage, red, yellow and green national flag on rudder. 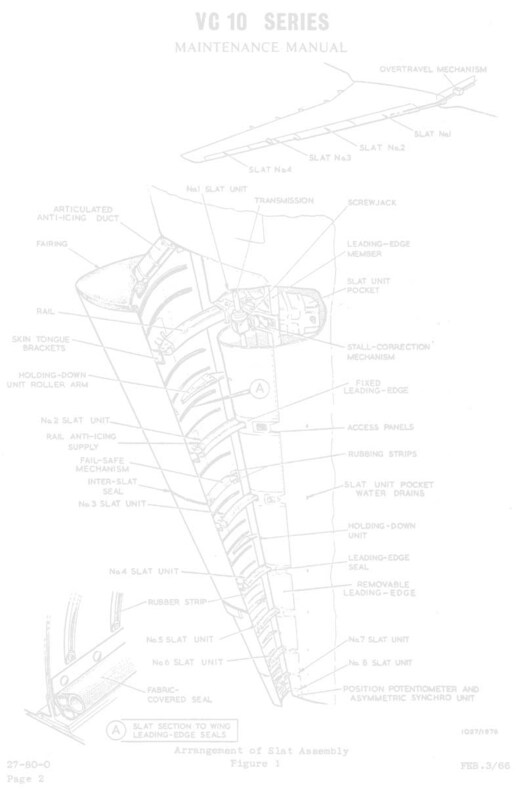 Centre portion of rudder was initially white on first testflights. 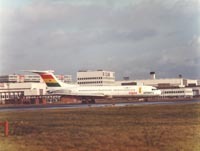 GA White fuselage with grey belly, yellow doors and red, yellow and green national flag over full fin.